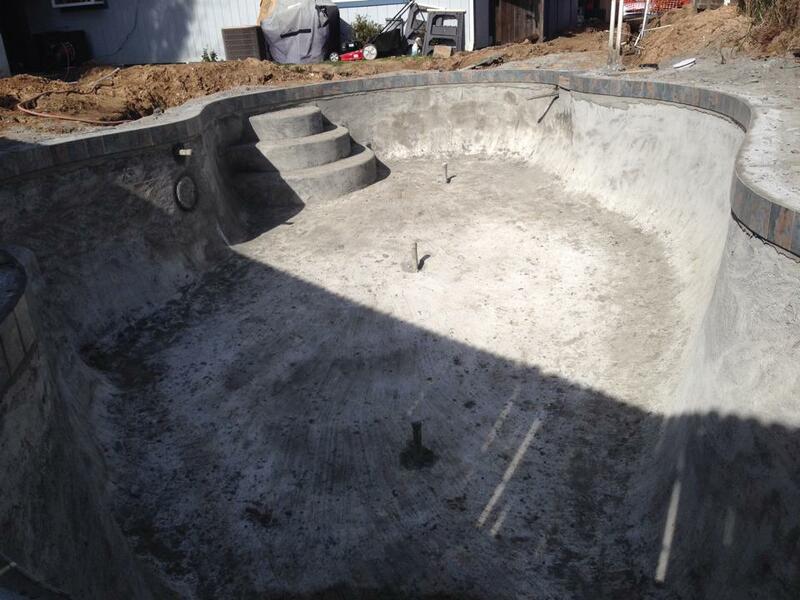 If you are looking to build an inground gunite pool in the Folsom, CA, area, you can anticipate the process to be completed through a number of phases. Most phases during the construction of your swimming pool build upon the previous one, although some may overlap. They each can take from one to seven days to finish. While the process may be done by different crews or trade contractors, you can simplify construction by relying on a Folsom swimming pool contractor that can do most of the work in-house. As you prepare to undertake this project in Folsom, CA, learn more about what to expect during the different phases of construction. The design of your gunite pool depends on the size of your yard, property line setbacks, underground utilities and topography, as well as your personal preferences on style and shape. Options to consider include the type of edges and entrances/exits; benches and other fixtures; pool equipment, such as slides, ladders and rails; lighting features; and pool cleaners. Be prepared for this phase to take a while as you sift through the various decisions you must make. Once you've made selections, your designer can draw the plans and submit them for city or county permits or Homeowners Association approval. Now comes the messy part. Expect a lot of equipment as the crew digs out the area where your pool is going to be installed. Generally, they start by painting and staking the shape and size of your pool on the surface of the project site. They may remove trees, plants or other objects on the site. Then, they dig into the ground to produce a hole that is roughly the shape of your new pool. Unless you request to keep the dirt, it gets transported away. During this phase, steel rebar is used in a grid pattern to create a sort of skeleton and provide structural support for the pool. The material is set about two to four inches from the wall of the dirt, mimicking the shape of the hole. The plumbing also is done in this phase. The crew installs drains, skimmers, cleaner lines and returns. Next, gunite – a mixture of sand, cement and water that is applied through a pressure hose to produce a dense hard layer of concrete – gets poured around the steel framework and is shaped to create the shell of your pool. The gunite needs to dry and be cured, which can take a few weeks. During this time, watch for crumbling areas or large cracks, and alert your construction team if you see any. The next phase of construction can begin as the other is in progress. During this phase, the crew places the perimeter pool tile and pool coping stones – which generally are milled flagstone, brick or precast concrete – along the lip of the pool. Your pool deck also may be added and the expansion joint in between the back of the coping stones and the pool deck may be caulked to prevent debris from blocking the expansion joint. During this phase of construction, a licensed electrician installs your pool’s electrical breaker box, or sub-panel, that powers the electrical outlet, lighting and pump timeclock. The electrician then connects the lights, equipment and accessories to the sub-panel. Different lighting and spa control systems are available to fit your needs and preferences. At this point, you’re nearly done. The crew puts a finish – usually plaster, but also marble, paint or tile – on the surface of the interior basin of your pool. Not only is the finish decorative, but it also protects the pool shell and makes it easier to clean. Make sure to follow any critical care instructions provided by the construction crew. Finally, you fill the swimming pool with water. Before it is ready for use, however, you must apply the proper chemicals and make sure they are balanced to create a safe swimming environment. The initial chemical balancing of the water should be done by your builder. They also complete any final equipment installation or adjustment and clean up the project site.